Definitely not an ideal, but I’m not sure how this is all that different than other retail commercial businesses. Presumably banks want people walking by and seeing other happy people banking just as much as a restaurant wants people walking by and seeing happy people eating. 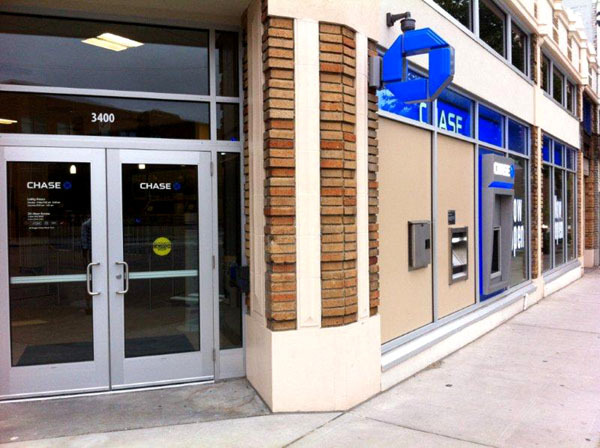 The other cause could be that banks actually don’t want so much visible facade (since you suggest that they are underutilizing it) but they are forced into these locations since they are the only ones zoned for commercial use. In that case providing some more flexibility in commercial zoning (which sadly failed last year) would be a way of providing slightly less visible commercial space for these types of businesses. Anyone know the reason for this wave of bank branch openings? With online banking and direct-deposit, I can only think of three times I’ve gone into a bank in the past three years or so – and my credit union branch was right in the building I worked in. Every time I walk past one of these banks, they’re almost completely empty. Monument building. The banks want to advertise how powerful they are and how they can crush individuals under their mighty boot, so they buy up lots of locations and, well, waste them. It’s a way of showing off that they can get away with it. Most of the major banks are in fact bankrupt and are cooking their books in order to not be shut down, so this sort of behavior should be be surprising from such criminals. Back in the 60s Jane Jacobs’ analysis was that banks can afford to pay high rents and tend to be risk-averse, so when retail storefront rents rise and the neighborhood is considered safe/low-risk banks start outbidding everyone else. Fremont is now full of software yuppies (full disclosure: I’m sort of one of them); yuppies are about as low-risk as it gets! Retail space in Fremont is, apparently, in high demand, and probably pretty expensive. I have no first-hand knowledge of this, but I assume it based on the number of marginal spaces in use: tiny storefronts like Just Desserts and Espresso To Go; second floors and basements like the Fremont Vintage Mall, Atlas, and Dusty Strings; spaces with alley entrances like the Russian dumpling place and tattoo parlor, and some of the businesses located behind those that front 36th St. Groundwork laid for bank invasion. Lower Fremont’s retail district is pretty thin north-to-south — there’s the office parks along the canal with offices on the ground floor, and north of 36th it’s nearly all residential until the little business district around Fremont/43rd. Banks make great companions to residential buildings. They are closed nights and weekends (maybe open a few hours Saturday). They are quiet when they are open, produce minimal garbage, do not attract street people, often have armed security during the day, attract a certain amount of special attention from law enforcement after hours. They do not have loud music or drunks at night. And some of them have cookies! Give me a bank over a restaurant or bar every time. They can be purple with pink dots for all I care. That sounds like a terrible fit. Safety requires eyes on the street – the more regular people you can get even late at night walking down your sidewalk, the safer it will be. Having empty, dark bank storefronts after 4pm is almost as bad as just having an empty store. If I had to choose what business I would most want near my home I think I’d choose a restaurant with no parking. Assuming around 40 customers that turnover every hour, that’s a group of 2-4 every four and a half minutes coming in or out of the restaurant using the sidewalk all the way until 10 or later. Even after that you’ll have workers cleaning and locking up. I think we’re seeing more banks simply because so many other types of retail (video stores, travel agencies, book shops etc.) have been whisked away by the internet. Obviously banking can be done online as well, but banks are profitable enough that they can afford to open large retail presences anyway. These presences act mostly as marketing (which is why the walls are essentially large billboards). 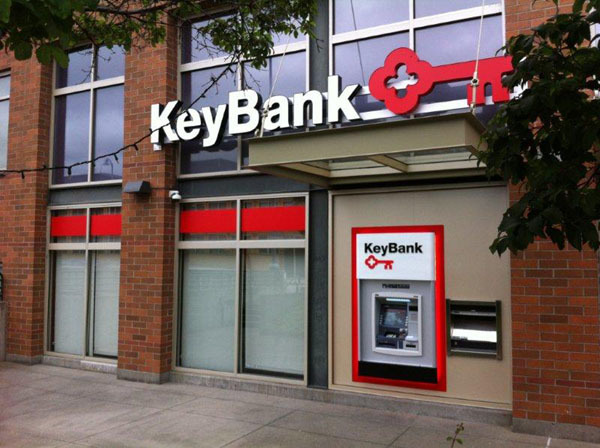 It’s a way for a bank to gain mindshare among the residents of the community. It actually doesn’t matter if anyone walks through the door or not. You’re telling me that renting building space, stocking it with furniture and other things, and employing a number of people to work there is a more cost-effective marketing strategy than traditional radio, print, tv, and outdoor advertising? I’m skeptical. I’m not saying that’s 100% of the reason for a retail branch, but it is a very important one. People want to know the branch is there, even if they never set foot inside. Cost-effective? Not at all. But you have to remember that these banks are in fact mostly bankrupt. They’re cooking their books by valuing bad securities and non-paying mortgages at full value in order to appear to not be bankrupt. These are not organizations which care about cost-effectiveness. What they care about is more *feudal* — they want to provide a large, hostile presence in town. Landlords love banks — they are long-term, reliable renters. The problem with banks that isn’t present with other retail uses is that many discourage the sort of transparency inside a building that other retail might (e.g. restaurants or shops trying to entice customers). It’s the same with medical offices or live/work units that haven’t quite made it to the work part yet. Queen Anne is a really good example of how banks impact street life. There’s 4 to 5 banks on Queen Anne Avenue, and most long-term residents I’ve talked to have sort of lamented how the it’s not quite as vibrant as it once was (though perhaps the mega-buildings there have something to do with it). I suppose my biggest issues with banks in terms of urban design is that they garner very little pedestrian traffic as a business, they are sometimes insensitive to their context (its as if they stamp their business design in there with sometimes no consideration), and they so frequently use blinds/window decals as if there should just be a wall there to begin with. Exactly — no matter how good the bank’s cookies are, no one goes to the bank with their friends to make some deposits, buy some CDs, and sit outside chatting over cookies at 8pm on a summer weeknight, and that’s exactly when I’d like my street life to exist. It’s also /where/ I’d like my street life to exist: by living in the center of a Seattle neighborhood, that’s the type of street life I’ve elected to have. If I wanted peace and quiet, I would have lived in Duvall. It’s a shame that banks seem to be the only businesses who can afford these central locations. 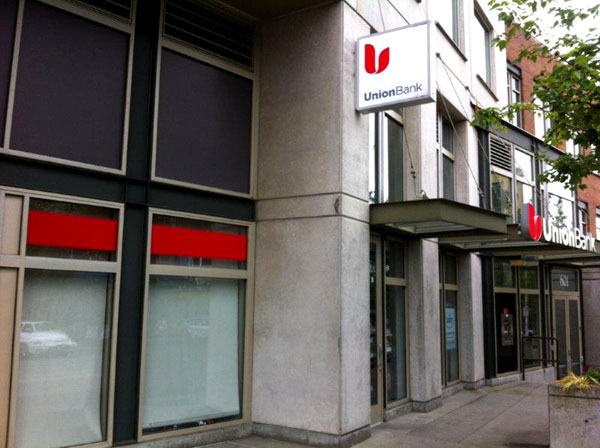 An interesting concept is Umpqua Bank. Here in Ballard they have tried to make themselves part of the community rather than just a bland storefront. No full window graphics of smiling people to hide what’s going on inside, when you walk by, you don’t immediately recognize that it’s a bank. On first glance it has that open style of a cell phone store. They participate in ArtWalk by hanging art from local artists, offer movie nights, business seminars, provide public computers/printers even for non-customers, even have a small retail outlet that features products from a local merchant (which you can buy right there).